Andy G: Let’s quickly get caught up since we last posted. On Wednesday, the Wolves blew out the Knicks. Kevin Martin — who we later found out suffered a broken wrist — had it going. He poured in 37 points and couldn’t miss. Mo Williams got his groove back. Shabazz Muhammad started at power forward (!) and had one of his best games ever (17 points & 8 rebounds). The Knicks looked tired and clueless, allowing Corey Brewer to rip the ball out of their hands and forfeiting three attempts to the red hot Martin. Amar’e Stoudemire looked great on the block against Gorgui — not a great sign for the young center’s development as a post defender — but Gorgui did enough other stuff (5 steals) to contribute to a great plus-minus of +22. Andrew Wiggins got to guard Carmelo Anthony for a bit — his education continues — and he also heated up for a fun stretch in the 2nd Quarter, scoring his only 12 points of the game. Friday’s game — last night — was not so successful. In Part I of the Punch-Drunk Preview, we’ll discuss topics ranging in seriousness and importance across the league as a whole. On Wednesday, we’ll get down to the specifics of this year’s Timberwolves team. A lot has changed in Timberwolves Land since mid-May. It was then that the organization was informed that Kevin Love planned to opt out and leave the franchise — per his contractual rights — in the summer of 2015. From that point through August 23, Flip Saunders was scrambling. Not only did he have multiple picks in the June draft, but he was also charged with the task of trading a superstar player. Rather than re-hash the process and results for the umpteenth time, it’s sufficient to say that Flip got ‘er done. For Love, he got back Andrew Wiggins, Anthony Bennett and Thaddeus Young. If either Wiggins or Bennett reaches his potential (or, gasp, if both do) it could go down as the greatest ever return in this “departing/disgruntled star wants out” trade scenario. Plus, Thad Young is already a good player who might fit nicely in a front court that already includes Gorgui Dieng and Nikola Pekovic at the center position. More specifically, there are too many guys that will expect — and *should* expect — some playing time. And that brings us to positional battles, and the possibility that some Timberwolves players will need to spend time in the D-League — playing for the Iowa Energy (technically this is the Memphis Grizzlies affiliate, but that’s where they sent Shabazz last year because the Wolves don’t have their own team). Saunders has extensive experience in minor league basketball, coaching in the old CBA, and is a firm believer in it as a developing environment for certain players. It seems inevitable that, at some point this season, a Wolf or two will be sent down for some game reps.
For a young basketball player, the NBA — even on the Minnesota Timberwolves — must feel a bit like heaven on Earth. There are the big crowds, the SportsCenter highlights, the glitz and glamor, and the competition against players that were considered celebrity heroes just a short time ago. The whole thing must be a real trip for a new player entering the league. The D-League… well, the D-League probably feels a bit more like Iowa. So we thought it worthwhile to run through the candidates for D-League Duty, and predict which guys might end up playing some minor league ball in 2014-15. Bill Simmons posted a doozy on Grantland today right before lunch on the merits of a trade involving Kevin Love to Cleveland for a package centered around this year’s #1 overall pick, Andrew Wiggins. 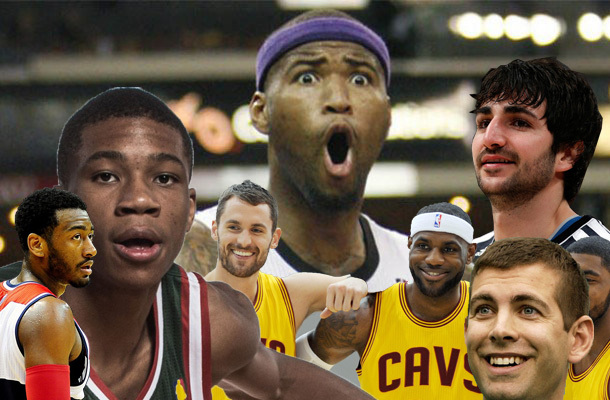 All of Grantland’s NBA hitters weighed in on Love-Wiggins: Simmons. Sharp. Trillion. netw3rk, Klosterman (does he still work there?). I was pretty stoked, at least by what-I-read-over-lunch standards. But after I read it, I left the cafeteria pissed off. 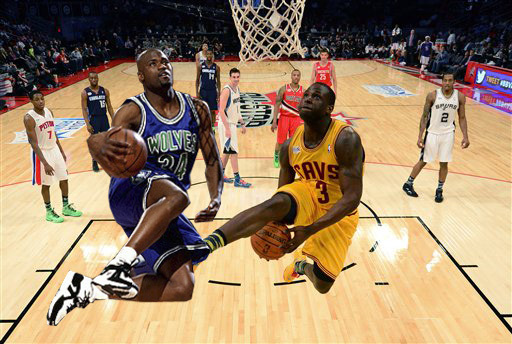 Dion Waiters: Eerily reminiscent of J.R. Rider. Future Timberwolf? Andy G: So, LeBron made another Decision. He’s going home to Cleveland; a decision that many in the media began to expect a few days ago. He wrote a great letter explaining everything, published by Sports Illustrated yesterday. The obvious player that the Wolves covet is Andrew Wiggins, the number one pick in the most recent draft. So far, the Cavs are reportedly not willing to part with Wiggins. Instead, they’re only willing to go as far as (something along the lines of) Anthony Bennett (LAST year’s top pick) and maybe Dion Waiters and one more guy to make the salaries match up. Maybe they’d throw in a future draft pick or two. The Wolves, by all reports to date, will not trade Love for the Bennett-Waiters package. They need Wiggins. So here we are, waiting for Dan Gilbert (or Flip Saunders) to blink. Do the Wolves end up with Wiggins? 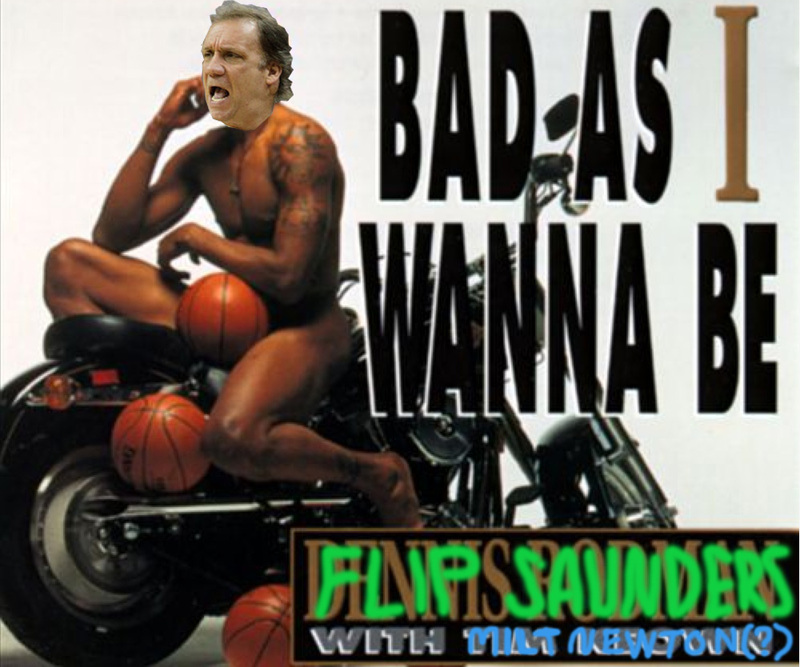 The Kevin Love Trade: How Bad Does Flip Wanna Be? Patrick J: There has been a lot happening around the Wolves over the past week. First, we got word that Kevin Love was likely going to use his early-termination option to explore free agency after the 2014-15 season. At the same time, there were murmurs that the Wolves were looking closely at former Timberwolves player and Raptors coach Sam Mitchell as Rick Adelman’s replacement as Twolves head coach. When we last wrote, both of these stories had an air of uncertainty around it. Woj had broken the Love story in one of his “should-I-really-believe-this” megaexclusives. And the Mitchell news crept upon us out of nowhere and felt like a shock to the system. Since then, the Kevin Love news has only gotten more play, while the Sam Mitchell rumor quickly went away (Eds. Note: There has been some speculation that Mitchell could end up as an assistant on Joeger’s staff) –replaced by the rumor that current Grizzlies coach and Minnesota native Dave Joerger will be the one who succeeds Adelman on the Wolves sideline. The Inbox below is a list of scenarios that do not seem implausible ways in which the Wolves could decide to go with whatever type of “rebuilding” strategy they will have to do, assuming that Love is traded and Joerger is hired.